Ingredients: Fish broth, tuna, mackerel, modified tapioca starch, sunflower oil, natural flavor, calcium sulfate, tricalcium phosphate, guar gum, taurine, iron glycine complex, zinc glycine complex, manganese glycine complex, copper glycine complex, sodium selenite, potassium iodide, choline chloride, carrageenan, vitamin E supplement, niacin supplement, vitamin A supplement, vitamin B12 supplement, pyridoxine hydrochloride, calcium pantothenate, riboflavin supplement, biotin supplement, vitamin D3 supplement, folic acid, menadione sodium bisulfite complex, thiamine mononitrate, magnesium oxide, sodium nitrite. Unfortunately, our team has not been able to confirm that this product meets any AAFCO nutrition profiles. We rely on the companies website to provide this information. 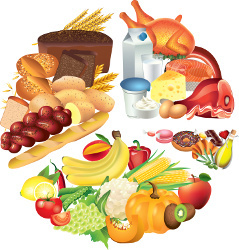 However, we were not able to find a nutritional adequacy statement on the company's website. We caution owners from feeding non-AAFCO approved products because these products may not contain all of the nutrients required by your cat. We'll begin this review of Iams Purrfect Delights Tempt Me Tuna & Mackerel Dinner Flaked In Sauce with a detailed discussion of the ingredients. The first ingredient is fish broth. Fish broth provides both flavor and moisture; however, as with other broths, fish broth does not provide any notable nutritional contribution. The fourth ingredient is modified tapioca starch. Tapioca starch is a gluten-free starch extracted from cassava roots. Starch is a necessary component in producing kibble and tapioca is an excellent choice in this regard. The modified term indicates that the tapioca starch has been treated or processed in order to expose or improve some property. The fifth ingredient is sunflower oil. Sunflower oil is an omega-6 fatty acid source. Unlike other oils (flax, canola, etc), sunflower oil does not provide omega-3 fatty acids; However, the balancing omega-3 fatty acids are most likely supplied by another oil or fat source. Because ingredients are listed in order of pre-cooked weight, the remaining ingredients in Iams Purrfect Delights Tempt Me Tuna & Mackerel Dinner Flaked In Sauce are not as important as the first five ingredients. However, collectively they still have a significant impact on the overall quality of the product. Therefore, we'll continue discussing the remaining ingredients in this Iams recipe. Next we have natural flavor, which is used to enhance the flavor of the food. Moving on with this review, we have taurine, which is an amino acid. As with other amino acids, taurine is required for the proper functioning of the body. 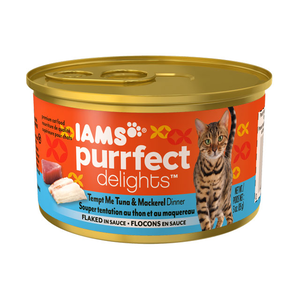 The remaining ingredients in this Iams Purrfect Delights recipe are unlikely to affect the overall rating of the product. The official PawDiet rating for Iams Purrfect Delights Tempt Me Tuna & Mackerel Dinner Flaked In Sauce is 3.0 out of 5.